videos, stories, poems and more. It’s Sunday afternoon and the audience of 300 or so are settled into the pews of Centretown United Church in Ottawa. There’s rustling and murmuring through the crowd as the choir they’ve come to hear file to the front, close to 80 of them in their white shirts, and black pants and skirts. As they take their places, facing the audience, familiar patterns come into view: tartans displayed on neckties and scarves, specific to the province each member chose to represent: Nova Scotia and Cape Breton, New Brunswick, Prince Edward Island, and Newfoundland and Labrador. Taking her place with them is Margaree, a Newfoundland dog. The choir begins the first notes and for the next while, the singers fill the room with the sometimes haunting, sometimes joyful sounds that evoke the spirit of the East Coast. They are, after all, Atlantic Voices: The Newfoundland and Labrador Choir of Ottawa. Founded in 2002 by soprano Kristina Curren, who was looking for a musical way to connect to her Newfoundland and Labrador roots, Atlantic Voices has enjoyed 17 years of success in the nation’s capital. “There were people from the Maritimes and Newfoundland and Labrador who are just away from home, and they wanted to get back to that. And one way to do it was to start singing that type of music,” explains Atlantic Voices president Winston Babin, who’s been with the choir since 2007. He and his wife are both from New Brunswick and moved to Ottawa in 1988. She’s also a longstanding member of the choir’s house band, the Fumblin’ Fingers. “They play before each one of our concerts. They basically warm the crowd up for us,” Winston explains. Atlantic Voices puts off two big concerts a year, on the last Sunday in January and the last Sunday in May. They also perform at special events, such as July 1 Beaumont-Hamel memorial services. They’ve produced 29 albums of their music to date, which they sell during their concerts. It’s one way they raise a bit of money; another is an annual yard sale. They also have a silent auction, which is held after each concert in combination with another very downhome thing they do - a scoff. Atlantic Voices attracts not only East Coast expat singers, but also anyone with a love of choral music and the Atlantic provinces. Same goes for the audience, which Winston says includes a large contingent from Atlantic Canada, but also folks from all over. The choir is also a hit at local seniors homes, where they often perform between concerts. They have an extensive library of music, Winston says, and the director draws upon that to create a theme for each concert. “Like our last show [January 2019] was ‘Music from the Big Land,’ which is Labrador. So it was all Labrador music, which was really interesting because we’ve gone for so long that we didn’t have enough music for a show strictly on Labrador. But it turns out that some very interesting people - like Kathleen Allen, for instance, who is a Newfoundlander - they… arrange music so that it can be sung by a four part choir,” Winston explains. Voices. As far as Winston knows, theirs is the only choir that concentrates on one geographical region. “The other concerts, of course, have the choice of doing any kind of music they want, but we don’t because we’re restricted to what our repertoire is, which is Atlantic and Celtic music,” Winston says. And that niche, it seems, has been hitting all the right notes. For Robert Miller of St. John's, there's no better way to see Newfoundland and Labrador than on a motorcycle. But he's not just roaring along the TCH and city streets; his bike takes him down gravel roads and over ancient footpaths to places cars just canât access - and over terrain your typical motorcyclist wouldnât dream of taking their sweet ride.Robert is part of the growing worldwide community of adventure riders - bikers who journey off the beaten path to unique and scenic destinations. âAdventure riding is about seeking out new places by following the roads and trails unknown,â says Robert. â[Adventure riders] want to travel to get to see something special.â Since he took up the hobby in earnest four years ago, Robertâs explored most of the island and has journeyed through Labrador, Quebec and the Maritimes on his adventure bike - a class of motorcycle specially designed for long-haul trips and light off-roading. âTheyâre somewhere between a dual-purpose dirt bike - an off-road machine with lights and gears and all that - and a heavier highway bike,â explains Robert. Theyâre equipped with bigger engines than typical motorcycles, are able to carry more luggage and have a larger front wheel that can handle bumpy terrain. Cable John Cove, near Dungeon Provincial Park, is one of the most scenic places Robert says he's been on his adventure bike.Itâs taken Robert to some of his favourite places in the province, like Cable John Cove near Bonavista. âItâs a little bit east of Dungeon Provincial Park; itâs absolutely stunning,â gushes Robert. âThe park is centred on the Dungeon, a hole in the ground, but the view over there is a hundred times better.âThis summer Robert and his adventure bike headed down the Burin Peninsula on a solo journey.âI went to Jean de Baie [northeast of Marystown] and I found some trails there which end up in the next community,â says Robert. âOftentimes theyâre unmarked trails - youâll find two communities always had a trail because they were next to each other for 200 years. Itâs not on a map, but itâs there.â Oftentimes, Robert says, itâs just a matter of tracking down a local to ask about little known trails and paths in their area - and in many cases, the locals come to him.âI find people give you a queer look and then they come on down in their truck and they talk to you. They always do, they have lots of questions - where are you going to? Have you seen this? Have you tried that? Theyâll strike up a big chat with you. And thatâs great because thatâs part of the trip then. I met a guy in St. Lawrence and he was just great, telling me all about the history of the town, the mining roads and everything that were around.âAt Bay LâArgent, a crane hoisted Robertâs bike onto the Northern Seal (the ferry has the capacity to carry six such bikes - but no cars or trucks), and he headed off to the remote south coast community of Rencontre East. Accessible only by sea or air, there are no vehicles in the tiny outport, where gravel roads are well worn by foot traffic and ATVs - and now Robertâs adventure bike.Robert's bike is hoisted onto the ferry Northern Seal.âItâs a little bit of a step back in time and you kind of get to see the heritage of Newfoundlanders and Labradorians,â says Robert. And itâs just this sort of destination that Robert believes would appeal to adventure riders not just from this province - but those from away as well.âAdventure riders are interested in going out of the way. Adventure riders do not ride to Florida, they just donât,â says Robert. âAnd Newfoundland is exactly that - itâs a destination off the beaten path to a lot of people. Weâre less well known, more country, more undeveloped.âRobert believes the global adventure riding community is rife with untapped tourism potential for this province. With minimal effort, Robert suggests, Newfoundland and Labrador could become a hotspot for such travellers.âAbandoned roads and tracks are cost-effective resources that can be easily expanded to provide continuous adventures,â he says. âThey only need to be identified on maps, lightly improved in the worst sections and loosely linked together.âOff the beaten path near Tickle Cove, NLDrinking in a sunset near Frenchman's Cove, NLFor his part, last year Robert established a group called NL Adventure Rider on the social networking website www.meetup.com, in an effort to make it easier for adventure riders to meet like-minded individuals and arrange travel in groups. The group has more than 100 members so far, who mainly hail from the Avalon Peninsula - but itâs open to adventure riders anywhere who have an interest in riding in Newfoundland and Labrador. While Robert organizes rides and social gatherings from time to time, the group basically runs itself, with users taking it upon themselves to arrange trips - which could last anywhere from a few hours to several days. âItâs a facilitator,â says Robert. âPeople can create their own rides, do their own things.â In addition to providing a platform for meeting other adventurers, the group also helps foster rider safety. Although Robert has become accustomed to riding on his own, he says itâs not something he would encourage - especially in remote areas.âRiding solo can be dangerous,â he warns. âIâve went very remote by myself, Iâve also crashed by myself - Iâm still limping, and if I had broken a bone, honestly, Iâd have to wait for somebody to come find me. You canât drive a motorcycle if youâve broken any limb - you can drive a car out pretty broken up, but you canât drive a motorcycle.âAdventure riding has landed Robert in a few sticky situations. (Photo taken near Gaskiers, NL)And considering the sometimes tricky terrain, adventure riding can lead to sticky situations where an extra set of hands can come in handy - like the time Robertâs bike became stuck in a bog between Gaskiers and St. Vincentâs, or when he broke down halfway between Happy Valley-Goose Bay and Port Hope Simpson.While Robert may be a city dweller and always has been, he says the provinceâs rural places have found a special place in his heart. There was a time when Robert says he didnât know Newfoundland and Labrador past the highway. It took an outsiderâs perspective to shed light on all that he was missing. âI kind of learned a lesson from some tenants of mine from Colorado, who were just touring all over Newfoundland seeing all these wonderful things that I never knew about. It was a bit of an eye opener,â says Robert. 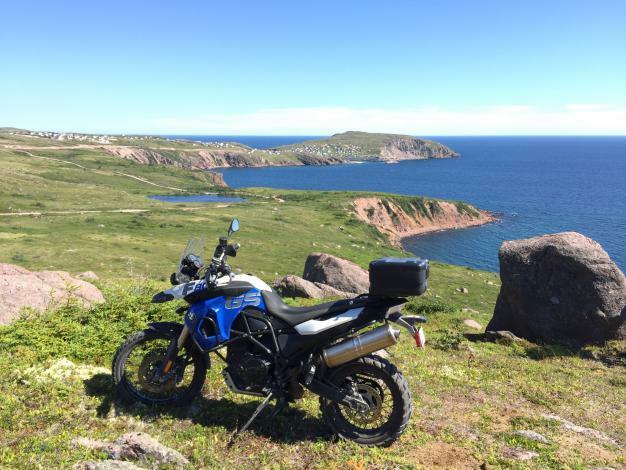 And while an adventure bike is his vehicle of choice, Robert says he feels itâs important for Newfoundlanders and Labradorians to get out and explore, no matter their mode of transportation. âYou donât need a motorcycle,â says Robert. âGo see the province in whatever you got, get out there. Stop waiting.â - By Ashley Miller Click here for Robert's top 10 adventure riding routes, plus tips on finding your own trails. It's a clear, crisp Sunday evening in downtown St. Johnâs and the February snow blankets the ground in a sparkling sea of white. At the bottom of Victoria Street, at the historic LSPU Hall, children in winter coats and mittens walk in through the doors, some toting along bodhrans almost as big as them. The sounds of accordion, guitar and fiddle float on the air. It may be freezing outside, but in here the kitchen party-like atmosphere has cast a warm glow. Some may have the impression that folk and traditional music is fading into the background. But thanks to the annual Young Folk at the Hall program, organized by Fergus OâByrne of Ryanâs Fancy fame, a new generation of traditionalists is playing loud and proud. Like Father, Like SonYou might say that Fergus OâByrne is a born entertainer. He studied piano as a child growing up in Dublin, Ireland and fondly recalls gatherings with family and friends where anyone who could sing a song or play a tune would take turns entertaining. âYou came in and everybody would sit in a circle and people would do a party piece...so I would play 'FÃ¼r Elise,' for example, and my mother and father would sing a duet, and then maybe a cousin might tell a story or an uncle might sing another song,â he says.When he was 14 years old, his father brought home a mandolin, and then a guitar. A couple of years later, in the late â60s when the folk revolution was in full swing, Fergus gravitated towards singing. When he was 19, he came to Canada and set out searching for an office job, but it wasnât long before he âtumbled head over heels into the music scene.ââI quit my day job and became a full-time musician. And so thatâs what Iâve been at now these last 48 years,â he says.In 1971, Fergus moved to Newfoundland with his Ryanâs Fancy bandmates (Denis Ryan and the late Dermot OâReilly). While the young men planned to make music to put themselves through university, their spirited live performances and television series made them bonafide legends, inspiring a younger generation of Newfoundlanders and Labradorians to rediscover and embrace their traditional roots. Some might say that Fergusâ son, Fergus Brown-OâByrne, 31, is following in his fatherâs footsteps. But the younger Fergus is dancing to the beat of his own bodhran. While he was constantly exposed to traditional music through his parents, âthe actual learning and playing of it is really his own take on the whole thing,â says his father, who, as a touring musician, was on the road frequently when his son was growing up. Fergus OâByrne (right) with his son, Fergus Brown-OâByrne. (Gerard McGrath photo) An accomplished musician in his own right and a member of the band The Freels, the younger Fergus has made a name for himself on the provinceâs traditional music scene. Like his father, he learned to play piano as a child, eventually mastering the accordion, fiddle and concertina, and a number of other instruments, along the way. While some may think of it as their âgrandparentsâ music,â there was never a point, he says, when he considered trad music to be âuncool.â These days, heâs sharing his love of the jigs and reels with his own music students. âI always really enjoyed it. Itâs a really fun style of music to play,â he says. âThereâs always a new level you can kind of push it thatâs mechanically really challenging. So I always found that engaging.â Music & Friends When his son was a teenager, the elder Fergus began thinking of ways of bringing together young people who, like his son, had a passion and penchant for playing traditional tunes. âMy wife Irene used to take him down to the sessions (at the pubs), to have him exposed to the music. So I figured there must be kids out there who also play, but are not coming down to the sessions. So then we sort of dreamt up the idea of Young Folk at the Hall,â he says. Sixteen years later, Young Folk at the Hall (YFATH), produced in collaboration with the Newfoundland and Labrador Folk Arts Society, is still going strong. The idea is simple, but its legacy is profound. The program (which is volunteer run and free for participants) brings together youth aged 7-18 for two, two-and-a-half hour workshops led by mentors - many of whom, like Fergus Brown-OâByrne, participated in the program in previous years. âBecause the programâs been going on long enough now, some of the people Iâve mentored are now mentors. So itâs kind of the third wave of people going through the program,â he says. The youth are put into groups and are encouraged to tap into their creativity as they come up with their own band names and practise tunes from a traditional repertoire. âThe whole idea is to really give as much ownership to them as possibleâ¦they bring the repertoire to the table; they, with the mentor, arrange it; and they come up with the name and how theyâre going to present it,â says Fergus Sr. The workshops (which give youth the chance to share with, and learn from, each other and bond over a love of traditional music) culminate in a live concert at the LSPU Hall with all the bells and whistles of a professional stage show. In the below video, Conor's Angels (consisting of Kiera Hynes, Jenna Maloney, Conor Nemec, Grace Abbott and Paige Pike), perform "Is You 'Appy" during this year's show.âThe stage hands are there, theyâre setting up the mics and the lights, so the children come out and as far as theyâre concerned, theyâre in Carnegie Hall. We treat them as professionals and we respect them for that,â says Fergus Sr. âA lot of these kids havenât worked together before. Theyâve just been thrown together. Theyâre very tentative when they meet, like all people are. But within half an hour, through the mentorship and the love of the music, they tend to just really fall into it. And then by the time theyâre ready to go to stage, theyâre just all bubbly and excited.â For the elder Fergus, YFATH is also a way to pass on some of the knowledge and kindness that was shared with him and his bandmates in their earlier years. âWhen I came to the province first, I had the great fortune to meet Rufus Guinchard, Ãmile Benoit, Pius Power, Mack Masters, Minnie White - all those people who were tradition-bearers in their own communities. And they generously gave to us their time and their music and were patient with us to sit down and chat,â he says. âThatâs what music is all about reallyâ¦the idea of passing it along.â Beyond the Overpass YFATH has grown so popular (this yearâs event in St. Johnâs saw its highest registration yet at 52 participants and included two concerts and a traditional dance troupe) that several years ago, Fergus started taking it outside the city to places like Stephenville, Marystown, central Newfoundland and Conception Bay South. This May, heâs bringing it to the Songs, Stages and Seafood Festival in Bay Roberts for the second time. 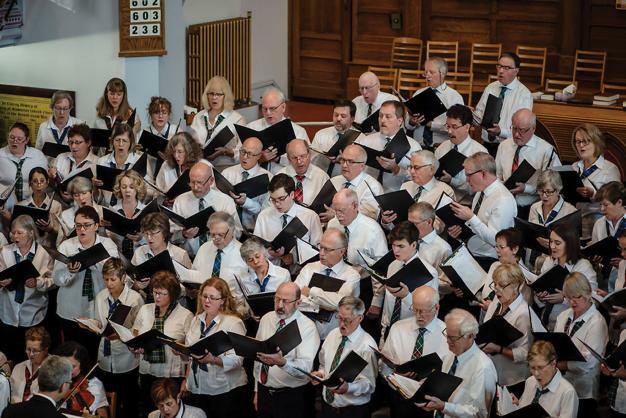 The workshops will take place on May 20 and 27, followed by a concert at St. John the Evangelist Church Hall at Coleyâs Point on May 28 at 7 p.m. âItâs quite extraordinary really. When I started it 16 years ago, I had no idea that it was going to end up as it has,â he says. The program has made a lasting impression on many of the youth. Some of the previous YFATH participants have kept up with performing, such as Fergus Brown-OâByrne and Danny Mills of The Freels; Rosemary Lawton of the Pints; and Aaron Collis of The Dardanelles and Rum Ragged. âSo thatâs a good sign that as younger people start playing together at an early age, then it keeps it going,â says the younger Fergus. âAnd even if they havenât stayed full-time with the music,â adds his father, âitâs given them a bigger appreciation of traditional music, and not only traditional music, but their own culture.â Judging from the talent and enthusiasm on display at this yearâs concert in St. Johnâs, itâs clear that the future of the provinceâs traditional music scene is in good hands. Some of the accordionistsâ feet may barely sweep the floor, but from their tiny wooden chairs, they command attention, their audience hanging on every note. Fortunately, it looks like YFATH is here to stay, if Fergus OâByrne has anything to say about it. He hopes it will continue âforever and ever,â he laughs. âThe Folks Arts Society...are very, very pleased with what itâs doing and their mandate is to promote and preserve traditional folk music and story and song,â he adds.âAnd thatâs what Young Folk really is doing. Itâs giving those kids the passion." - By Linda BrowneFor more information on YFATH in Bay Roberts, visit www.bayroberts.com/sss/ or email fobyrne@nl.rogers.com. By Dennis Flynn Walking along the plateau atop Gros Morne Mountain in August 2011, I was contentedly drinking in the amazing view of dark, distant ponds cradled in the mountain valley, where silver rivers snaked their way towards inland fjords far below. Over lunch break, while still enthralled by natures wonder in a place so removed from civilization and industrialization, I was invited to take part in, of all things up here, a high-tech treasure hunt using a friends GPS (Global Positioning System). Within 15 minutes we had found the hidden treasure, traded an item in the cache with something of our own, and soon headed back down the mountainside. We had conquered a mountain and found a hidden treasure  not bad for a casual summer day. While Id like to say what we accomplished was extraordinary, it certainly was not. Its not even unusual. There are thousands of these little treasures hidden in public places all over Newfoundland and Labrador, including almost all the major parks and developed trail systems. They are on the tops of mountains, under rocks on scenic beaches, hanging from branches in the woods, stowed away behind statues and monuments, tucked under boardwalks and stuffed inside bushes. The most historic lighthouses of the province have them nearby, as do many resettled communities. Some are in the heart of the cities near busy intersections, while others are on remote islands in the depths of the wilderness. The vast majority of people passing by these sites dont even know somethings hidden there. But there is a growing number of enthusiasts who make it their pastime mission to track and find these objects, and to place items of their own for others to seek out. 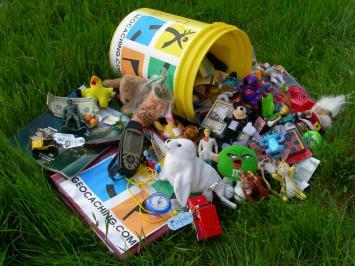 Its all part of a worldwide technology-based treasure hunt called geocaching. The sport has been around for a few years, since hand-held GPS devices became common tools (sometimes toys) for those who spend a lot of time on the water or in the wilderness. And the newest smartphones are equipped with GPS so that even those who might never have ventured far are now lured into trying it out. The term geocaching describes the activity that combines geography (pinpointing places using longitude and latitude coordinates) and cache, which is the place where items are hidden. The basic premise is that organizations and individuals hide caches all over the planet and share the latitude and longitude coordinates (waypoints) on the Internet. Searchers program the waypoints into their GPS units or their smartphones, then attempt to find the caches and access the wide range of rewards stored in them (typically they are trinkets with no real monetary value). Each geocache has a unique code name associated with it, and players can log their finds on the website www.geocaching.com. Basic accounts are free and do not expire so (aside from the purchase of a GPS or appropriate smart phone) there is no cost to try geocaching. Caches are ranked one to five, easiest to hardest, in degrees of difficulty to find and degrees of difficulty of terrain. While seasoned hikers and the more adventurous may appreciate the level five caches, many novices find that the easiest caches make a fun activity for families. Geocaching has even spawned a new kind of travel called techno tourism, whereby people actually plan vacations and trips around their geocaching activities. Last spring, there was a Canada-wide geocaching contest that enticed people to national sites. Geocaches containing a password could be found at select national parks, national historic sites and national wildlife areas throughout Canada, with chances for participants to win prizes. Some groups in Newfoundland and Labrador, such as the Kittiwake Geocaching Network, have also planted caches to capitalize on this trend and bring new high-tech tourists to their area. This past summer, the Bay Roberts Cultural Foundation sponsored several Geocache Weekends (with prize draws for those completing a prescribed series of caches) along the towns beautiful Shoreline Heritage Walking Trail. With the widespread use of Global Positioning Systems (GPS) and all the hiking trails and beautiful shorelines in the province, geocaching is an excellent activity to promote tourism, says Margaret Ayad, organizer of the Bay Roberts event. We found people really enjoy the search, and from the photos and comments they left, they bring family, friends, and even pets. When you find a cache, the rules for what you do next are pretty straightforward: 1) You sign a logbook to record your visit. 2) You take something from the cache. 3) You put something else back in the cache to replace what you took. Most items found in caches are small, durable and of relatively low value, but make interesting conversation pieces or geocaching trophies. Obviously no food, drugs, alcohol, ammunition or anything that could damage the caches should be included. 4) Finally, log your find under your free account at www.geocaching.com. One of the more interesting items to find in a geocache is a Travel Bug (also called a Hitchhiker), which is a small object that is carried from cache to cache by different geocachers. 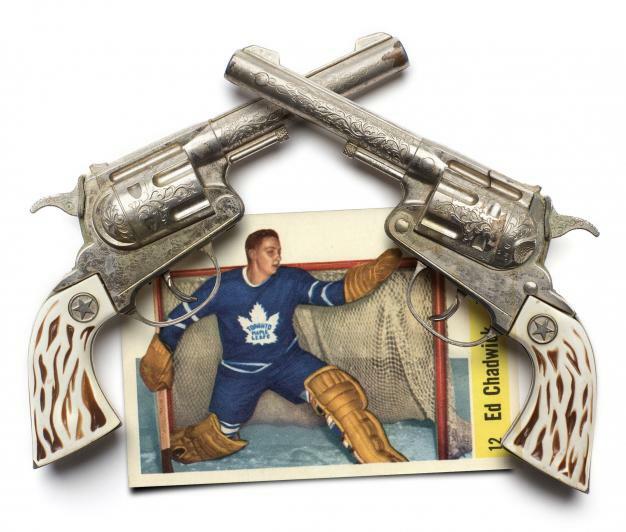 These objects (often labelled with a special tag or identification number) end up travelling around the world. The Travel Bugs adventures are also tracked online through www.geocaching.com. As of press time, there were (according to Geocaching.com) more than 1,538,598 active geocaches and more than five million geocachers worldwide. More than 4,365 of those geocaches are in Newfoundland Labrador, with the number growing all the time. Downhome has placed a geocache somewhere in the wilderness of Newfoundland and Labrador. Want to find it? Click here.